I’ve always had an on off relationship with getting fit…sure I understoood the benefits, but just getting up and doing it was always a struggle. Then a while back I had the realisation that unless I’m working towards an event – like a sponsored event – I have absolutely no motivation when it comes to exercise. So, that gave me the motivation – but delving a bit deeper I realised it wasn’t so much the event (having an end goal, and the purpose) that gave me the results I wanted, where the magic really happened was that I was exercising consistently. It was by doing something consistently that I started to see and really notice, the change, the improvements, the value, and just how far I’d come, and this is the case for so many things. By doing something consistently you not only create a habit, but also an expectation with the people around you that this is the new normal – which creates an additional motivator. By doing something consistently you build momentum. The issue is that sometimes (and I speak from personal experience here) doing something consistently is much easier said than done. Our rational minds might know and understand the benefit and value of doing something on a regular basis, but secretly our subconscious brain has other ideas and we go off track. That’s why so many people quit the gym soon after joining in January (yep I’ve been that person!) and when that happens it’s so easy to: (a) come up with the thought process that ‘it just didn’t work for you’, (b) come up with a great excuse that you don’t have the time or (c) you now have to wait until…. [New Year, when you’ve finished a project, recruited a new member of the team, come back from holiday – fill in the gap here] until you start again. If this is sounding familiar, and you find yourself starting something with great intentions like: doing regular one to ones, team meetings, or working on a personal project but then go off track…join the club. 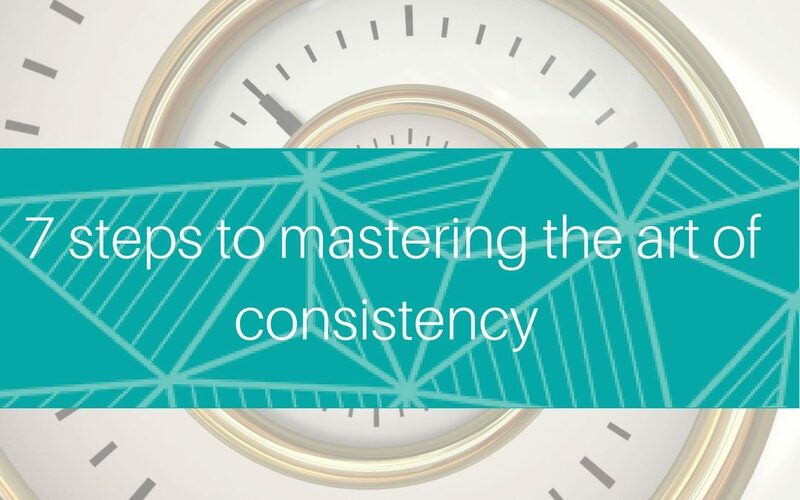 Consistency, although sounds like a super easy thing to do, can actually be a really hard thing to maintain. After all it’s just doing something regularly right? Like I said…I speak from experience here. As someone who used to be a chronic un-finisher of personal goals – I know this really well. To be honest, I’ve done a lot of work on myself to master doing things on a consistent basis. In fact, it was how I wrote my book. 1000 words a day without fail…every single day…and I have to say, although I had my dips where my whole being wanted to do something (anything) else, the fact that I’d committed to it every day was a real motivator. This is a first step that you shouldn’t miss as it’ll really help you further down the line when you want to ditch and run. What value is it adding? What results are you hoping to see? In the case of me finishing my book I knew that there was no way I could write it all in one sitting, so doing something on a regular basis was the only option. If it’s having 1-1 meetings with your team is it that you know that this catch up is invaluable for you and them and you just don’t want to let them down? By really nailing down the value that this task has, you’ll be able to not only motivate yourself, but also look out for the results. 2. Decide whether you need to do the task, or whether the task just needs to be done. Again, this is part of the pre-work. In some cases it’s just the task that needs to be done but it really doesn’t have to be done by you. If this is the case, delegate or outsource, as it’ll save you some space in your day and effort later down the line. This is the biggie right here. We all have our own personal flavour of sabotages…where our brain will throw all sorts of things at us to make us stop – and they’ll come. I promise you. Delaying tactics….Convincing yourself that you’re not quitting or stopping you’re just rescheduling. Taking too much on – This is a sneeky one as you can actually kid yourself that you’re adding value elsewhere. Looking for failure – If it didn’t go completely to plan the last time you did it, you might take this as a reason for stopping altogether. Multi-tasking….and not focusing completely on what you’re meant to be doing. I like to call these ‘sabotages in disguise’. Any of these jump out at you? For me, procrastination is a personal favourite and an old friend of mine. The trick here is that awareness is the first step. Once you can start to recognise when you’re sabotage is coming out to play, you can call yourself out on it and see it for what it really is so you can move on. How you do this depends on you. For some people sticking it in your diary and making time to do the task is key (especially when it involves other people). Personally, I like to make a deal with myself that goes something like this...’I won’t go to bed tonight until I’ve done X’ – this is good for the tasks that just involve you, like exercising, or writing etc. Again, this is a simple one but absolutely golden. Set reminders that pop up on your screen or phone, work wonders. Takes seconds to set up but works a treat. I’m a big one for seeing how far I’ve come – so every so often write down the value and benefit you’ve seen so far. It’ll really spur you on. We all love a bit of recognition don’t we? Whenever you do the task give yourself a pat on the back or a treat. It doesn’t have to be anything flash. Sometimes all it takes is a secret ‘Yay, I’ve done it today / this month…woohoo’ under your breath to keep you going. So, these are my steps for mastering the art of consistency. Give them a try. I’d love to know: What’s your own flavour of self sabotage and what are you doing about it? Step 1 – let me know in the comments what you’d love to do consistently and why. Step 2 – Connect with me on Linkedin or Facebook and keep me updated with your progress on the Friday post.